Smother Goose: "Little Bunny Foo Foo"
Our children's rhyme begins with an unprovoked assault by a roving Lagomorphological sociopath. 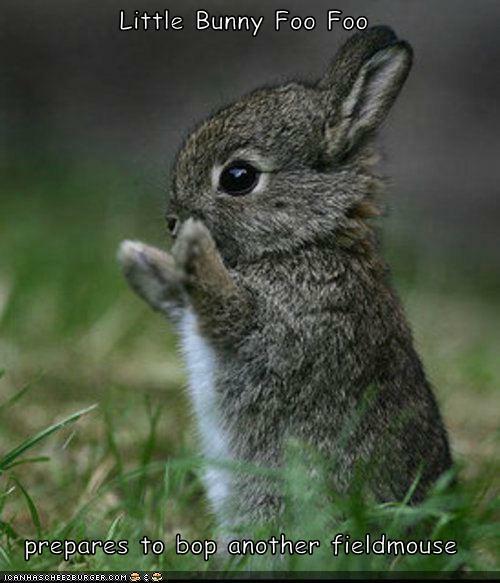 To wit, "Little Bunny Foo Foo, hoppin' through the forest, scoopin' up the field mice and boppin' 'em on the head!" The Good Fairy is displeased with this behavior, and she says she will give our boy Foo Foo three chances, and if he doesn't behave, she "will turn [him] into a goon." But what exactly does the threat of becoming a goon entail in this context? What exactly is a goon? Let us turn to the Oxford English Dictionary to find out. The OED traces the etymology of "goon" to a comic strip character called "Alice the Goon," a giant Amazonian woman with hairy forearms and a flowered hat, featured in Popeye cartoons. It seems unlikely that this is what the Good Fairy is thinking of; wouldn't increased height and powerful forearms only render Foo Foo a more formidable enemy to the field mice? The most common use of "goon" is to denote "a stolid, dull, or stupid person." But that seems pretty much like the status quo for Foo Foo, doesn't it? Bunny MENSA members probably don't count "bopping field mice on the head" among their hobbies. There is a definition for "goon" that means one who is "hired to terrorize workers," but again, whether the mice are in a union or not, that's pretty much what Foo Foo's already doing, isn't it? So, if there is no real threat to Foo Foo here, is the Good Fairy suggesting not that he stop his behavior, but that he modify it to be more effective? Would a new verse have Bunny Foo Foo breaking their knees instead? If the mice are in a union, is the Good Fairy a racketeer? And are these the kinds of values we want to teach our children? I think it is clear that by "scooping up the field mice and bopping them on the head", little Bunny Foo-Foo is guilty of performing unsanctioned lobotomies in an improper medical setting, thus rendering the poor field mice (who are obviously just in need of good mental health care) nothing but gibbering goons. The good fairy, then, naturally represents in this case either a discretionary agent acting in an oversight capacity to ensure the field mice are properly protected, possibly the medical board coming down hard on Little Bunny Foo Foo for practicing surgery without a license, or an organization like PETA lobbying on their behalf. Since all the parties in question are rodents, PETA can be effectively ruled out, as they would have a conflict of interest in taking either side against the other. So the Good Fairy, acting on behalf of the medical establishment, sanctions Little Bunny Foo-Foo, choosing the unconventional and drastic step of lobotomizing Foo-Foo himself, so that he is now incapable of performing more unauthorized surgeries. It should be noted that the disciplinary action is taken only after Little Bunny Foo-Foo has been given three chances to reform, which I'm sure anyone can see is a scathing indictment of the lax regulation inherent in a system, wherein physicians are allowed to police their own industry; clearly Foo-Foo should have been stopped before his gleeful head-bopping spree resulted in further field mice casualties. Within the larger context, we can see that the song is meant to serve as a cautionary tale, warning patients to properly assess their physicians to ensure that they are board-certified in their specialty before undergoing any serious medical procedure, especially one so invasive and potentially damaging as brain surgery. LIttle Bunny Foo-Foo, though its use of scare tactics is quite blatant, also effectively illustrates, through anthropomorphic analogy, the benefit to physicians in both maintaining proper licensure and carrying the appropriate malpractice insurance. I would love to hear your take on "Rock-A-Bye-Baby"!! When I was a kid, 10 or 12 years old, in the early sixties, we told it to little ones as Little Rabbit Foo Foo, not Bunny!